Ichiro Akuto, the man behind Ichiro`s Malts, has made his own pure malt. 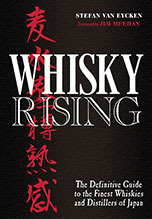 His card series has put an electric shock through the Japanese single malt world in recent years. Perhaps this "Ginkgo" pure malt will start to do the same for the rest of the market? Half of the bottling is for export and the Number One Drinks Company in the UK is handling distribution in Europe. They have a notice on their website saying Ginkgo is now available. Ginkgo calls itself a "blended malt" on the label and others would call it a "vatted malt" but basically what all these terms mean is that Ichiro has gone round several different Japanese distilleries and concocted his own blend. While it is quite normal in Scotland to have different groups' distilleries contributing to one blended whisky or pure malt, the Japanese market has traditionally been divided on company lines: Suntory doesn`t blend with Nikka, Nikka doesn`t blend with Karuizawa and so on. This is therefore a bit of a coup for Ichiro and, although a relatively small bottling (6,000 bottles, I think), it is quite an interesting development for the Japanese whisky market. I wonder which distilleries contributed? 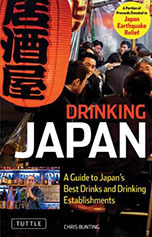 Does Ginkgo include Suntory or Nikka whisky? Or is this a ganging up of the smaller players? Intriguing questions to which I will be trying to find the answers. Anyway, the Number One Drinks Company have a nice marketing line for the new pure malt: "Ginkgo’s intriguingly complex nose and spicy palate make it an ideal accompaniment to Japanese and other Asian foods." Clever! Like the "Kingfisher lager" of whiskies? Not to be knocked back with a cheap biryani though: one bottle is going to set you back around £52 if you are in the UK. I'm eagerly awaiting my own taste of this but the well known Whisky writer David Broom has described it as a light, well balanced pure malt with spicy, acidic notes. His tasting notes are here. Update (17 November): It seems the "Chrysanthemum" name has been dropped. For more on this, see this post. This is pretty exciting. I don't expect sudden love between Japanese distillers since Japanese companies are so insular, but maybe it'll be the stone that begins the eventual landslide of J-blends!